apologies for the lack of posting…. Oh dear, haven’t posted for a while. In the past ten days I’ve moved house, one of my pet rats had a lumpectomy and spay, I attended the NUS LGBT annual conference (where our LGBT Network won LGBT Society of the Year!) and I’ve been trying to compile my annual report. Tomorrow I’m going to a session on whether my thesis is publishable (hah), and on Wednesday I’ll be presenting at the annual Postgraduate Symposium in my department. 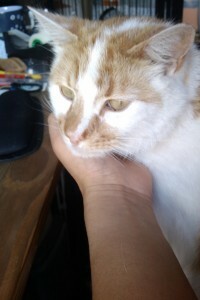 Today I was “helped” with writing my annual report by Itchy, one of my housemate’s cats. His help seems to consist of purring and kneading my leg with his claws, but I’m not refusing any help I can get. At the moment, I would very much like it to be this time next week. Tagged being a PhD researcher, conference, LGBT.